Planning processes are underway as part of a proposal to add residential use to two urban renewal sites in North Watson. 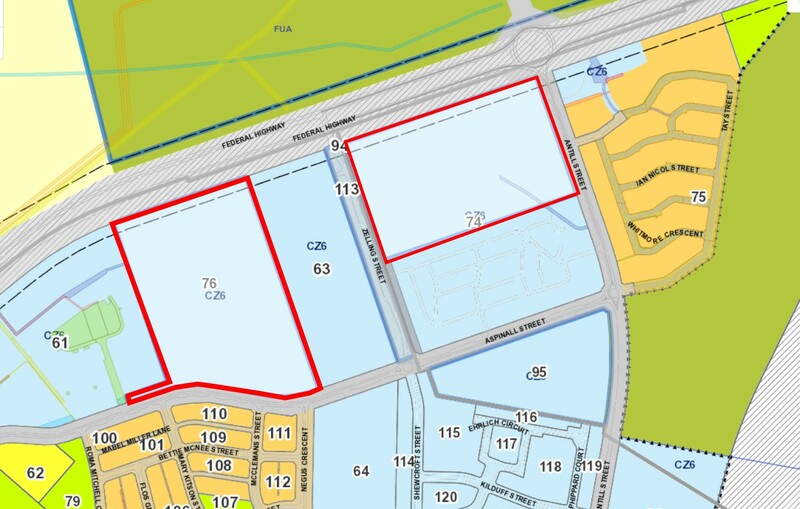 Two sites in Watson adjacent to the Federal Highway, Blocks 10, 11 and 12, Section 74 Watson and Block 2 Section 76 Watson are listed on the ACT’s Indicative Land Release Program for release in 2020-21 and 2021-2022. These blocks are currently zoned as CZ6 Leisure and Accommodation. infrastructure and threatened species habitat. community’s comments on the proposed Territory Plan Variation. SGS Economics and Planning undertook preliminary community consultation in June and July 2018 which will inform the planning report to be provided to ACT Government. The Planning Policy Division within the Environment, Planning and Sustainable Development Directorate (EPSDD) will consider the findings from the preliminary consultation process and planning report and, if appropriate, progress a Variation to the Territory Plan. There will be a statutory consultation stage if a Territory Plan Variation is progressed. Read the outcomes of Preliminary Consultation for Planning Report for Section 74, Block 10,11,12 and Section 74, Block 2, Watson. In June and July 2018 SGS Economics and Planning undertook preliminary consultation to inform the development of a Planning Report, which will be provided to ACT Government. For details of the engagement, read the Preliminary Consultation for Planning Report, available in the Documents section of this webpage. Delivered to Access Canberra, EPSDD Shopfront, Ground Floor South, Dame Pattie Menzies House, 16 Challis Street, Dickson.